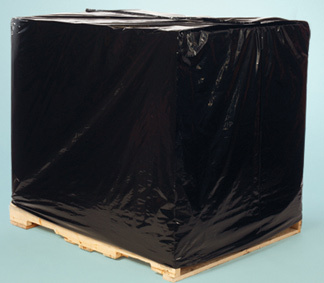 Black Opaque Pallet Covers help to prevent pilferage, by hiding the identity of the pallet contents. Guard your products from the harmful UV rays. Our Black Pallet Covers have protective UV additive to allow storage of goods outdoors up to one year. UVI pallet covers are available in custom sizes. Call today for a quick quote of your Custom Black Pallet cover requirements. Fits Pallet size 48 x 48 x 48"
50 x 42 x 69"